The Bayeux Tapestry Museum is rich with history and makes for an extremely interesting visit. The museum has an audio guide which makes it very informative for those visiting it for the first time. A great insight to the history of William the Conquerer and his conquest of England all depicted over 70 meters of linen. 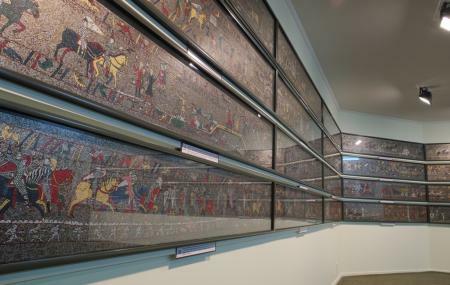 The museum also houses a cinema room that screens a documentary about the history of the Norman Conquest and the tapestry. To sum it up, the Bayeux Tapestry Museum is an informative museum with attractive work and a remarkable display. You can take a second and third round around the museum; however, the audio can’t be stopped or paused in between. The museum is open on all days of the week. Children below 10 years of age: Free. How popular is Bayeux Tapestry Museum? People normally club together Reporters Memorial and Museum Of The Battle Of Normandy while planning their visit to Bayeux Tapestry Museum. The tapestry was gorgeous and incredible. Audio guide was quite informative as well. We were pleasantly surprised that they had a kids version of the audio guide also that our children were very into. Lovely place. Tapestry is great however felt a bit rushed with the commentary and not enough time to study the work. But beautiful. The tapestry is very cool to see and the free audio guide that walks you through it is well written. One of our group thought it was too fast, I thought it went an ok pace. My father really enjoyed seeing this. It was interesting how long they recorded time with a piece of fabric. I was a little bored, but my father loved it so that made it better for me.